All input ports or clock pins of a sequential element are considered as valid start point. All output port or D pin of sequential element is considered as End point. For STA design is split into different timing path and each timing path delay is calculated based on gate delays and net delays. In timing path data gets launched and traverses through combinational elements and stops when it encounter a sequential element. In any timing path, in general (there are exceptions); delay requirements should be satisfied within a clock cycle. In a timing path wherein start point is sequential element and end point is sequential element, if these two sequential elements are triggered by two different clocks(i.e. asynchronous) then a common least common multiple (LCM) of these two different clock periods should be considered to find the launch edge and capture edge for setup and hold timing analysis. It starts at input port and ends at output port. This is pure combinational path. You can hardly find this in a synchronous design. Semi synchronous; Register is controlled by the clock. Input data can come at any time. Purely sequential; both starting and ending flops are controlled by the clock. Data can come at any point of time. The path wherein clock traverses is known as clock path. Clock path can have only clock inverters and clock buffers as its element. Clock path may be passed trough a “gated element” to achieve additional advantages. In this case, characteristics and definitions of the clock change accordingly. We call this type of clock path as “gated clock path”. The process of “clock gating” has main advantage of dynamic power saving. The path wherein data traverses is known as data path. Data path is a pure combinational path. It can have any basic combinational gates or group of gates. Launch path is part of clock path. Launch path is launch clock path which is responsible for launching the data at launch flip flop. Launch path and data path together constitute arrival time of data at the input of capture register. Capture path is part of clock path. Capture path is capture clock path which is responsible for capturing the data at capture flip flop. 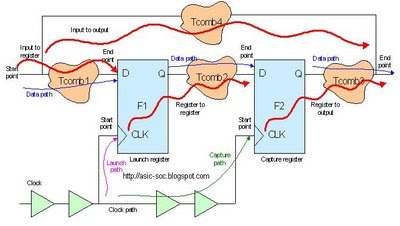 Capture clock period and its path delay together constitute required time of data at the input of capture register.